Dragons Abreast Northern Tasmania Inc (DANTI) have been paddling since February 2008 and are based at the North Esk Rowing Club opposite the Seaport. We enjoy all the facilities at the club, including excellent gym equipment and a restaurant and bar. From this situation we can easily access the Cataract Gorge, the upper reaches of the Tamar River and the lower reaches of the North Esk River. We are also able to launch the ‘Tamar Tittilator’ from various ramps along the Tamar, especially at George Town, Hillwood and Gravelly Beach, where we receive terrific support from the locals. 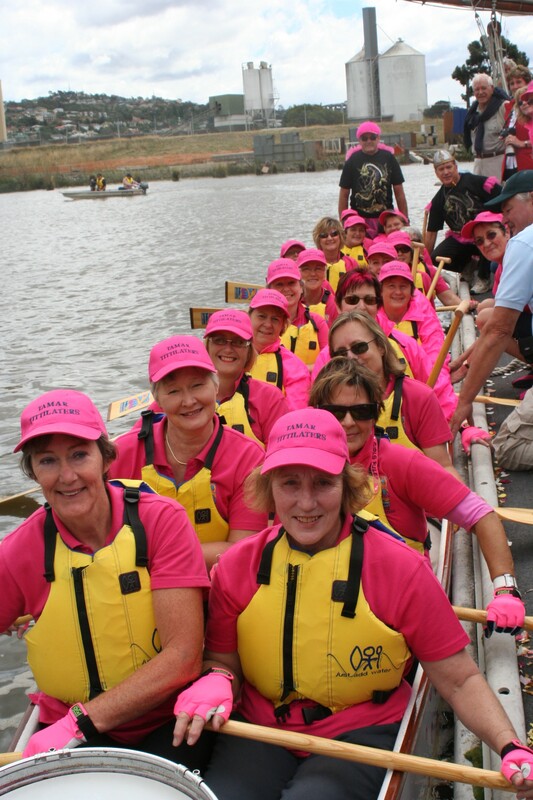 We are members of Dragons Abreast Australia – breast cancer survivors of various ages from a diverse range of backgrounds, athletic abilities and interests. High on our list of priorities is having fun, trying new things, meeting interesting people and being involved in a challenging physical activity whilst promoting breast cancer awareness. We invite all breast cancer survivors and supporters to come and experience the magic that is part of our unique team – not necessarily as a paddler; there are many tasks that we welcome assistance with.